Camden Council is hosting a public forum on Wednesday 27 January to hear the public’s views on long-term proposals by the University of London for its Bloomsbury campus. 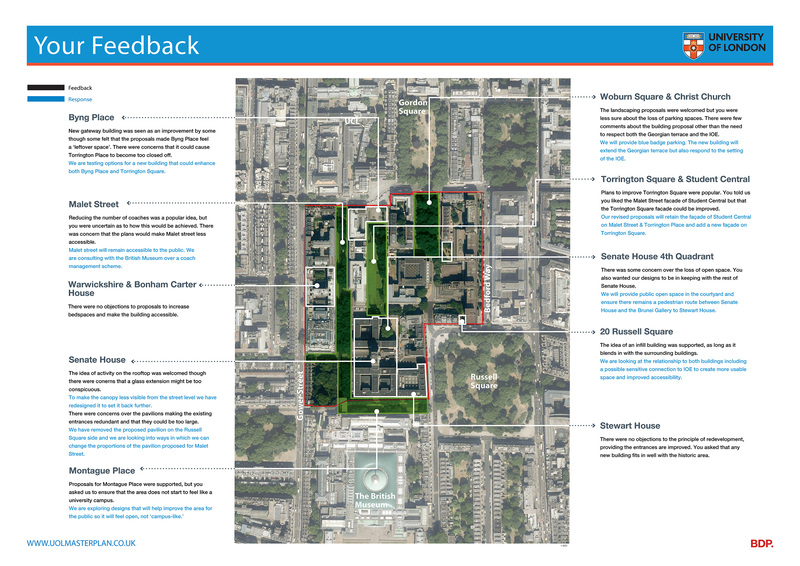 The University of London Masterplan for the Bloomsbury campus. The University of London Masterplan will inform the estate strategy over the next 15-20 years and set out key principles, aspirations and development parameters to inform future development on the campus either by the University itself or by its affiliated colleges. The University of London says it wants to prepare for the demands of future growth and “establish Senate House as the spiritual heart and academic hub of the university with a new entrance, orientation and an arrival experience that is accessible for all” and “increase and improve the quality and quantity of green space”. Camden Council will hold a development management forum at Senate House to give local people the chance to see what is being proposed and give their comments before the masterplan is finalised. After a presentation by the University there will be an opportunity to ask questions and to give views on the proposals. Canden say the forum will not be a decision-making meeting but an opportunity to answer questions and raise issues. “The masterplan will not be adopted by the Council and the Council will therefore decide planning applications which follow the masterplan its merits following normal planning rules,” says Camden. Camden Development Management Forum about the proposed University of London Masterplan: 7pm to 9pm Wednesday 27 January 2016 at Chancellor’s Hall, Senate House, Malet Street, London WC1E 7HU.